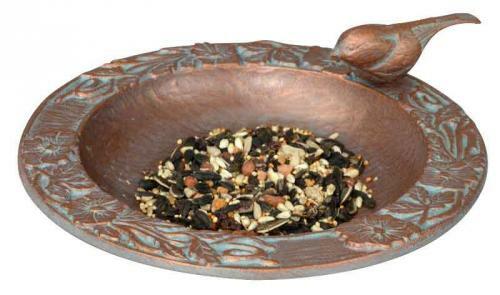 Chickadee Garden Bird Feeder - a beautiful garden bird feeder with a special focus on the dear little Chickadee. Made from recycled aluminum in a beautiful Copper Verdi finish with open access to fill and clean. Our Chickadee Garden Bird Feeder measures 9in D X 16.5in H (includes one 17 inch H stake). A delightful bird lover gift! A perfect addition to that special place in your garden or courtyard.